Protect your home or office hard floor from daily wear and tear caused by chair casters and legs with our Office Marshal eco-friendly PET mat. Made from 100% PET (a form of polyester which is made from recycled products). Chair damage can cause costly and irreversible damage to hard floors, which makes a chair mat an essential part of any office environment. Simply place by your desk or table to help protect your floor, whilst allowing easy gliding of your office chair. By allowing your chair to move more freely the Office Marshal chair mat also helps in promoting important leg movement when sitting for prolonged periods of time, and is ergonomically designed to reduce joint and muscle fatigue. Sturdy, durable and non-slip, each chair mat is designed and produced to withstand heavy use. Translucent and discreet, the Office Marshal Eco-Series Chair Mat will blend in with your floor, providing sublte and reliable protection. Protects all hard floor surfaces including wood, laminate, tile, stone and vinyl. ECO-FRIENDLY SERIES: Certified with the Blue Angel eco label for a healthy indoor environment, the new Office Marshalexclusive eco series chair mat is your eco-friendly solution to floor protection. Made from 100% recycled PET, these floor mats are a great way to reduce your carbon footprint whilst maintaining the Office Marshalsuperior standard of floor protection - non-toxic, 100% recyclable, BPA & phthalate free, and free from tin, lead and other metals. PREMIUM PROTECTION: Designed to mimic the strength and durability of the original Office Marshalpolycarbonate mats, the eco series chair floor protectors are rigid and durable. Protects all hard floor surfaces including wood, laminate, tile, stone and vinyl, whilst remaining odor free and free from volatile toxic compounds to keep a healthy indoor environment. EFFORTLESS ROLL, STABLE GRIP: The unique surface texture of these floor protectors allows your office chair to move easily while carrying out daily tasks, but has enough grip to maintain controlled rolling so the chair doesn't skid around. Ease of rolling between tasks promotes ergonomic posture and helps to considerably reduce the risk of leg fatigue. 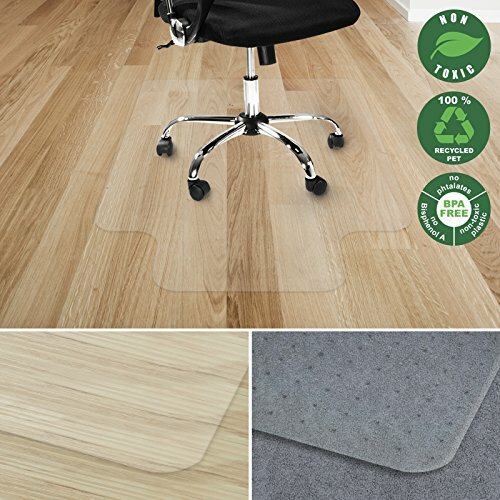 TRANSLUCENT: This mat for office chair helps protect while not completely taking away from the beauty of your floor. The mats are not completely transparent; for a crystal clear mat, please see our polycarbonate range. DURABLE: Our desk chair mats are designed for use on hard floors. Office Marshalbest-selling chair mats are designed to provide high impact resistance and under standard use will not crack, curl, break, scratch or discolor.